When was the last time you had an eye exam? If you can’t remember, or if you think your vision has changed since your last visit, it’s time to schedule an appointment with your local optometrist! An eye exam might seem like a nerve-racking experience, but it gives your doctor a prime opportunity to check your vision and assess the health of your eyes. Here’s exactly what you should expect during your next eye exam. Your doctor will ask about any vision problems and your medical history. If you’ve noticed blurred vision, headaches, or poor eyesight at night, mention those problems to your optometrist. 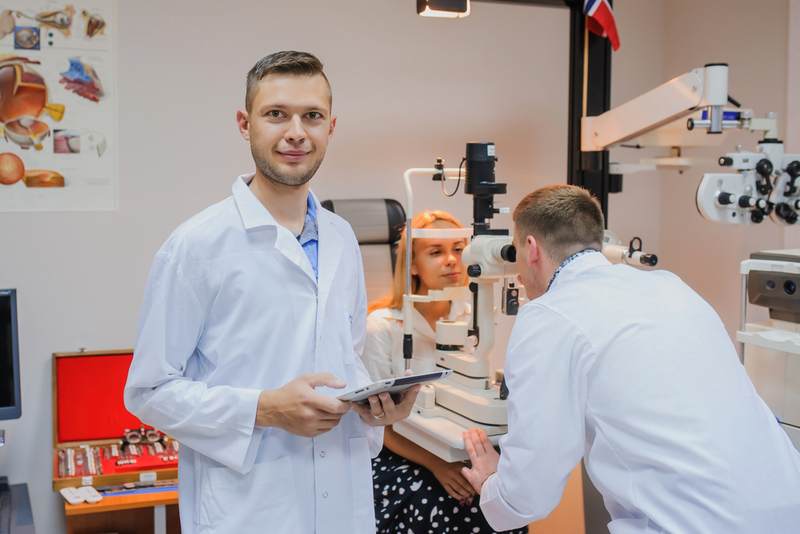 Your doctor will screen you for conditions like glaucoma and cataracts, but if you or your family have experienced eye problems in the past, your optometrist may also recommend scheduling an eye exam annually, instead of every two to four years. Eye Muscle Test: To check your eye health and vision, your optometrist will evaluate the strength, coordination, and control of your eye muscles by having you follow a moving object with your eyes. Visual Acuity Test: Your doctor will ask you to identify letters that are printed on a chart or screen to determine the clarity of your vision. Refraction Test: This test is used to determine the prescription of your eyeglasses. If you need corrective lenses, your doctor will ask you to pick between views through a lens. Visual Field Test: A few different tests allow your doctor to determine how well you can see in the perimeter of your vision. For example, in the cover test, they will cover and uncover each eye and ask you to stare at a target. Slit Lamp Test: Your doctor will examine your eye by illuminating it with an intense light. Glaucoma Test: A few different methods will allow your doctor to screen your eyes for glaucoma. One test involves using a puff of air to measure your eye pressure. This sudden burst of air is a little surprising, but it’s over quickly. Your eyes are important, and your health should be a top priority. If you’re overdue for an eye exam, schedule an appointment today! In the Rochester area, Reed Eye Associates is the top choice for people seeking eye care that goes above and beyond. With six convenient locations in Batavia, Irondequoit, Newark, Pittsford, Greece, and Sodus, the team at Reed Eye Associates is ready to help you see clearly again. Schedule an appointment by calling (585) 409-2020 or visiting their website today.